Forest soils in the southern United States are almost universally deficient in nitrogen (N) and phosphorus (P). These soils often exist near animal feeding operations that produce large surpluses of N and P in animal manure. Developing “win-win” alliances between animal producers and forest owners is an environmentally sound and economically viable way to use the valuable nutrients in animal manure as organic fertilizers to enhance production of marketable forest products. Fertilization can increase production of a variety of forest products as well as enhance ecosystem services. Short-rotation forest crops, such as nursery planting stock or woody biomass species, and annual crops such as pine-straw can also benefit from fertilization. This publication is based on a research project designed to investigate factors that make forest fertilization with animal manures successful in North Carolina. We investigated the practical experience and perspectives of animal producers, forest owners, and forest managers who have used or considered using animal manures to fertilize forests. Sometimes the swine or poultry producer we interviewed also owned or managed the forestlands where manure nutrients were being applied. North Carolina has more than 18 million acres of forestland (60 percent of the state’s total land area), almost 90 percent of which is privately owned. North Carolina forestland includes roughly 2.5 million acres of pine plantations, about 100,000 acres of which are fertilized each year, usually with synthetic chemical fertilizers. Plantations of hardwood trees are much less common in North Carolina and employ essentially no routine fertilization. Southern pine plantations were the most common type of forest being used for manure application by our interviewees. The manure nutrients applied usually involved moderate amounts of swine lagoon liquid or poultry litter (ranging from 40 to 100 pounds of N). Figure 1. 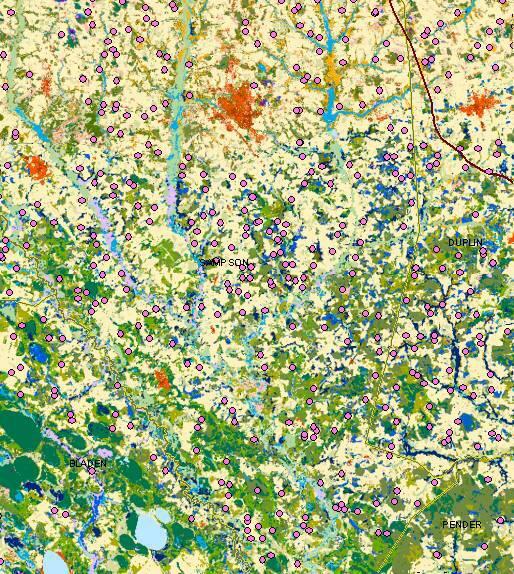 Swine farms (purple) and various forestland cover types (green) near the junction of Sampson, Duplin, Bladen, and Pender counties in southeastern North Carolina. Most southern pine plantations are limited by nutrient availability. Long-term research by the Forest Productivity Cooperative, a combined effort by researchers at NC State University, Virginia Polytechnic Institute (VPI), and the Universidad de Concepción in Chile (UC), indicates that most intermediate-age (8 to 20 years old) southern pine stands show a strong growth response to fertilization with N and P. A forestry professional usually develops fertilization prescriptions as part of a site-specific forest-management plan; a general recommendation for fertilization of mid-rotation southern pine stands is 150 to 200 lb N per acre plus 25 lb P per acre once every 6 to 8 years (Fox et al., 2007). A typical wood volume growth over 6 to 8 years is often about 30 percent but can be as high as 100 percent. Banded fertilizer application prior to bedding during plantation establishment at rates to achieve 25 to 50 lb P per acre is a worthwhile option on low P soil types. Longleaf pine requires less N for optimum growth than other species of southern pines (slash, loblolly, and shortleaf pines); thus a general recommendation for 8- to 20-year-old longleaf pine stands is 100 lb N per acre every 4 to 5 years. Four recent studies have documented 25 to 40 percent and up to 50 percent increases in annual production of longleaf pinestraw after fertilization with either poultry litter or synthetic N and P fertilizers (Blevins, 1994; Blevins et al., 1996; Environmental Impact, 2003; Allen, 2007). Lower cost fertilizer treatments. Using organic fertilizers, such as swine lagoon effluent or sludge or poultry litter, can offset the relatively high cost of synthetic fertilizers, such as urea and diammonium phosphate, that are commonly used to fertilize forest stands. Slower-release nutrients. Organic fertilizers release nutrients as organic materials decompose. Nutrient analysis reports from the NC Department of Agriculture & Consumer Services (NCDA&CS), Agronomic Division, indicate the nutrients available for use by a crop in the first year of application. In addition, manure adds secondary and micronutrients, including calcium, magnesium, sulfur, iron, manganese, boron, molybdenum, zinc, and copper, as well as organic matter to soils. Decreased energy requirements. Production of mineral fertilizers, especially N, requires significant energy. Use of readily and locally available organic fertilizers should reduce national and local fossil-energy requirements. For a forest owner, the financial return from fertilization is determined by the cost of the fertilizer and its application, the mix of forest products, and the increased financial return from enhanced production. Table 1 provides rough estimates of the potential effects of using manure for forest fertilization in North Carolina. Table 1. Potential effects of forestland manure application on forest product value and fertilization cost. 1 Based on 20 to 50 percent increase in yield with fertilization, and 20 to 40 percent increase in yield in longleaf pine stands. 2 Assumes constant prices in real terms. 3 Assumes 200 lb N and 25 lb P fertilizer prescription and no difference in application costs between synthetic and organic fertilizers. Some forestry consultants believe that fertilization would be a more common forest management practice if more forestland owners knew about the potential growth benefits. Access to a low-cost fertilizer such as animal manure could encourage more forest owners to incorporate its use in forest management plans. In 2010, more than 2,300 permitted swine feeding operations existed in North Carolina. The total amount of swine manure (wet plus dry excretions) produced here is estimated to be about 28 million tons a year. Swine operations are concentrated in North Carolina’s southern coastal plain. Animal operations are subject to state and federal environmental regulations. The North Carolina regulations for “Waste Not Discharged to Surface Waters” require any swine operation with more than 250 head to apply for and operate under a general permit (Title 15A, North Carolina Administrative Code, 2T.0100–.1600). Some farms operate under a National Pollutant Discharge Elimination System (NPDES) permit. Both North Carolina and national permits require swine farmers to develop a nutrient management plan that is approved by a technical specialist certified by the NC Soil and Water Conservation Commission. These plans are designed to maximize use of manure nutrients and minimize losses from the farm, and must include all land areas (including forestland) where swine manure nutrients are applied. Appropriate manure application rates are determined by realistic yield expectations (RYE) of a specific crop, characteristics of the specific soil, and the manure’s nutrient content. The most common method of manure management on North Carolina hog farms involves collecting swine waste materials in lagoons. The materials in swine lagoon liquid include urine, feces, spilled feed and water, and some bedding materials. In the collection lagoons, manure constituents are broken down by anaerobic bacteria, and some of the organic N is converted to volatile ammonia and dissolved ammonium ions. The lagoon liquid is used to fertilize nearby land, usually to support growth of agricultural crops; common crops are pasture crops, such as coastal Bermudagrass and ryegrass, or row crops such as corn and soybeans. Periodically, the sludge that accumulates in lagoons must be removed. Swine lagoon liquid in 1996 to 2006 had average plant-available nutrient analyses per 1,000 gallons of about 1.8 lb N, 1 lb P2O5, and 5.4 lb K2O (Cleveland et al., 2007). The nutrient content of swine lagoon sludge is greater per 1,000 gallons but also much more variable: 5.8 to 10 lb N, 12.6 to 35.5 lb P2O5, and 5 to 7.7 lb K2O (1999–2009 statistics, Cleveland et al., 2007). Permitted swine producers are required to have the nutrient content of their swine manure analyzed within 60 days of land application. Nearly 3,000 poultry farms in the North Carolina piedmont and coastal plain produce turkeys, chicken broilers, and eggs. Agriculture statistics indicate that 760 million broilers and 35.5 million turkeys were produced in 2009. The total amount of poultry manure (wet plus dry excretions) produced here is estimated to be 8 to 10 million tons a year. Turkey production is concentrated in the southern coastal plain; chicken production is distributed across the coastal plain and southern piedmont. Waste from poultry production is relatively dry litter that consists mainly of uric acid and feces plus spilled feed and dry bedding materials that can include wood shavings, straw, rice hulls, and similar materials. Farms with 30,000 or more birds must develop poultry dry litter management plans but are not required to obtain general permits. Poultry litter is removed from houses at intervals determined by the type of flock: as frequently as every 5 to 6 weeks for brooder houses and only once or twice a year for broiler houses. In general, poultry litter is used to fertilize nearby land, usually to support growth of agricultural crops. Farms that produce eggs often use a liquid waste management system; these farms represent a relatively small fraction of North Carolina’s poultry sector and are not considered here. The total amount of poultry manure (wet plus dry excretions) produced in North Carolina is currently estimated to be about 8 to 10 million tons per year. Based on 1996 to 2006 statistics, North Carolina poultry litter typically has a plant-available nutrient content per ton of about 29 lb N, 26.8 lb P2O5, and 40 lb K2O for broiler house litter and 24.2 lb N, 28 lb P2O5, and 26.6 lb K2O for turkey house litter (Cleveland et al., 2007). Regulations also require poultry producers to have the nutrient content of their poultry manure analyzed within 60 days of land application. Very prompt analyses of both swine and poultry manure samples can be obtained at modest cost from the Agronomic Division of the NCDA&CS. Figure 2. Chicken breeder population density in North Carolina, 2007, 5-mile grid. In general, forest fertilization systems have successfully utilized the same application methods and spray or spreader equipment traditionally used on agricultural crops—such as solid set irrigation systems, hose and reel, honey wagons, and spreader trucks. Ideally, a forest stand is planted at a spacing that will allow the equipment needed to pass through the stand and spray swine lagoon liquid or spread sludge or poultry litter. Thinning to remove rows at an interval, such as every fifth row in a forest stand previously established at a smaller spacing, or clearing lanes in naturally regenerated stands is also used to provide access over an entire stand rotation. The Natural Resources Conservation Service (NRCS) Nutrient Management Standard (Code 590) and Waste Utilization Standard (Code 633) provide technical guidelines for applying manure to forest plantations and croplands (see the NRCS Field Office Technical Guide). According to these NRCS standards for North Carolina, which are based in large part on guidelines provided by the NC Interagency Nutrient Management Committee, up to 60 lb of plant-available nitrogen (PAN) per acre per year is allowed for application on pine forestland, except for longleaf pine stands where 30 lb PAN/acre/year is the recommended limit. On hardwood plantation acres suitable for organic fertilizers, application rates should not exceed 80 lb PAN/acre/year. Higher N application rates on forestland may be approved by technical specialists designated by the NC Soil and Water Conservation Commission in situations where concentrated single waste applications may be necessary, such as lagoon closures or lagoon sludge management, or in cases designed to meet a specific forestry nutrition prescription in an approved forest management plan. In cases where concentrated single applications are needed, the total application rate should not exceed 300 lb N per acre. Such single applications should not be repeated more frequently than every fifth year, or every tenth year in the case of longleaf pine, so as not to exceed recommended average annual N application rates. Annual soil tests, taken at a soil-surface-to-6-inch sampling depth, must be completed in pine forest application areas to help determine potential for P leaching. If soil test agronomic P indices are above 50, then no additional animal manure waste application should occur on that forestland. A phosphorous loss assessment (PLAT) is not needed for forestland receiving animal manures. Negative impacts to streams, wetlands, and riparian buffers must be avoided when applying swine or poultry manure nutrients, and appropriate application setbacks must be observed. For North Carolina and NPDES permitted animal feeding operations, operations must observe setbacks set forth by their respective permits and North Carolina regulatory requirements. Manures may not be applied within 75 feet of an intermittent, seasonal, or perennial stream or river other than an irrigation ditch or canal. This requirement may be different than “NC Forestry Practices Guidelines” would dictate and should be considered (Title 15A, NC Administrative Code, 01I.0100–.0209). Some native plants adapted to low fertility sites are able to compete with introduced species because of limited forestland fertility. Applying organic materials may increase the potential for introducing invasive plants, enhancing their growth, or both. Because the effects of increased fertility in a native plant understory are not well understood, applications of waste materials in forestland where the health of native plant communities is a resource concern should be closely monitored for negative impacts. Any increase in the presence of noxious or invasive plant species in the communities should be noted and considered when applying animal manure nutrients. During interviews with forest owners and managers, we identified several perceived obstacles to using manure to fertilize forests and discussed potential ways to overcome them. The nutrient content of manures is more variable than that of synthetic fertilizers because of factors such as variability in feed sources and type of manure handling system. Nutrient analysis of manure samples provides detailed information about the plant-available nutrients in manures. Nutrient management plans require testing of animal manure within 60 days of land application. Many commercial forests are routinely fertilized using aerial application of granular synthetic fertilizers; the weight and volume of liquid manures, sludge, and litter precludes aerial application. Ground-based application can be used in many circumstances, as described above. One problem cited by producers who used a hose and reel for application was that liquid pressure can strip bark off trees. Spraying an appropriate distance from trees and reducing pressure at spray nozzles can alleviate bark stripping. In the case of poultry litter, interviewees raised concerns about coordinating the timing of both poultry house cleanout and forest fertilization. Maintaining storage areas for poultry litter, either on individual farms, within forests, or in centralized regional locations, is a potential solution to this problem. Because manures are low-nutrient materials, hauling distance can become a critical issue. Coordination of manure volumes and available forest sites is necessary to support application contractors. Some forest owners were concerned that rapid tree growth induced by fertilization would cause reduced wood quality. Recent studies indicate that N added in moderate amounts (100 to 200 lb per acre) to southern pines increased growth for 3 to 5 years and did not significantly change wood strength or stiffness (Clark et al., 2004). Some evidence supports better wood quality from balanced nutrient sources compared to typical urea and diammonium phosphate fertilizers. Some longleaf pine producers believe that high fertilization rates cause exceptionally large longleaf needles that decay quickly. Longleaf pine is particularly sensitive to high fertilization rates. Excessive fertilization can increase needle length and make stands susceptible to ice breakage, pitch canker mortality, and insect attack. It is important to use fertilization rates recommended for specific tree stands. A professional forester, N.C. Cooperative Extension specialists, or North Carolina Forest Service professionals can assist with fertilizer recommendations. Several longleaf pinestraw producers saw an increase in weeds as an obstacle to manure application. Fertilization with any nutrient source can cause increased growth of undesirable as well as desirable species. Problems with weed production can be minimized by timing any fertilization application relative to pinestraw raking and by using herbicide treatments. Heavy metals, especially copper and zinc, are used in some feed mixtures. Copper and zinc are required micronutrients for plant growth, though excess amounts can be toxic. Repeated applications of manures could cause a buildup of metals in soils and potentially runoff to waters. Metal accumulation may be less of a problem in forest soils than in agricultural crop soils because most forest soils have not been previously fertilized with manures and typically have low concentrations of micronutrients. Use soil testing to determine soil concentrations of metals or total dissolved ions in the soil solution and appropriate manure application rates. Interviewees expressed concern about the potential threat of disease to wild turkeys exposed to domestic poultry litter applied in forests. This seems to be a common worry. Anecdotal evidence exists of wild turkeys contracting diseases from domestic birds when confined in proximity to them; however, no research has substantiated transmission of disease to natural wild turkey populations because of exposure to domestic poultry litter applied to crop or forest sites. An important part of our research project with forest owners and swine and poultry producers was development of a geographic information system (GIS) database that contains general information for much of the state and more detailed information for the following nine North Carolina counties: Bladen, Duplin, Moore, Montgomery, Onslow, Pender, Richmond, Sampson, and Wayne. This database incorporates the following information: location of swine operations (2003); 5-mile grid locations of poultry farms (2007); location of highways, streets, municipalities, county boundaries, major water bodies, major streams and rivers basins for North Carolina; detailed location of water bodies for the Cape Fear, Lumber, Neuse, White Oak, and Yadkin River Basins; land use/land cover classes; parcels, soils, and aerial photography (2007) for the nine selected counties. As an example of a product from the GIS database, the map in Figure 3A indicates the parcels of land within a 5-mile radius of a swine finishing farm (the circle is centered on the farm parcel), that fall into these land cover categories: coniferous cultivated plantation or coniferous regeneration. This represents more than 11,500 acres; a similar calculation for a 1-mile radius (Figure 3B) yields more than 500 acres. Calculations can be made for different forest cover types and different radii, and for swine operations within a particular radius of a specific forest stand. Information about poultry operations is available on a more generic basis, so that data on poultry population or farm density in 5-mile grid squares relative to a specific forest stand can be provided. Land parcel ownership information is available to assist in connecting landowners. Similar information can be found by contacting local offices of your county tax assessor, N.C. Cooperative Extension, North Carolina Forest Service, USDA Farm Service Agency, or Natural Resource Conservation Service. Figure 3A. 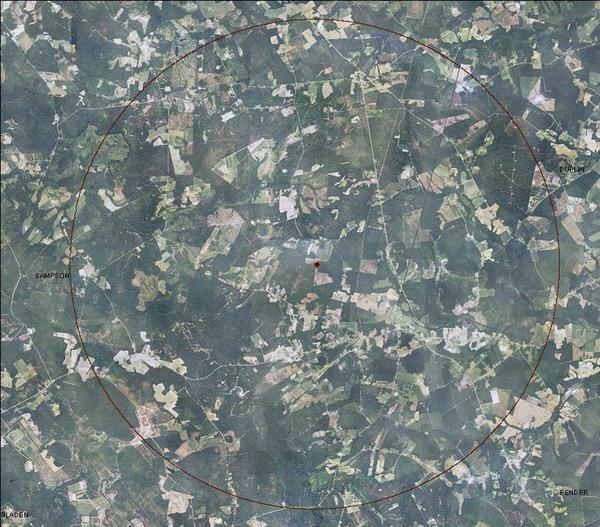 GIS database example showing parcels of land within a 5-mile radius of a swine finishing farm. Figure 3B. 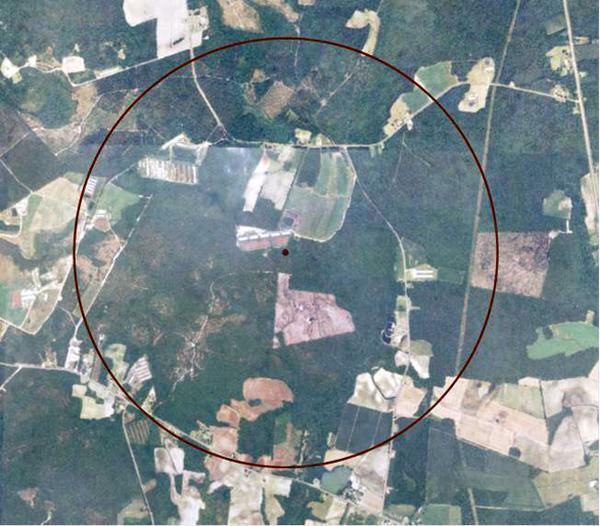 GIS database example showing parcels of land within a 1-mile radius of a swine finishing farm. Allen, M. 2007. Effects of poultry litter additions to a 31-year-old longleaf pine stand. M.S. Thesis. Raleigh: NC State University, Department of Forestry and Environmental Resources, College of Natural Resources. 47 pp. Blevins, D. 1994. Pinestraw raking and fertilization impacts of the nutrition and productivity of longleaf pine. M.S. Thesis. Raleigh: NC State University, Department of Forestry and Environmental Resources, College of Natural Resources. 65 pp. Blevins, D., H. L. Allen, S. Colbett, and W. Gardner. 1996. Nutrition Management for Longleaf Pinestraw. Woodland Owner Note 30. Raleigh: NC State University, NC Cooperative Extension Service. 8 pp. Clark III, A., B. E. Borders, and R. F. Daniels. 2004. Impact of vegetation control and annual fertilization on properties of loblolly pine wood at age 12. Forest Products Journal 54(12):90–96. Cleveland, B. R., M. McGinnis, and C. E. Stokes. 2007. Improving agricultural productivity and environmental quality. Raleigh: NC Department of Agriculture and Consumer Services, Agronomic Division. 2 pp. Cowling, E., C. Furiness, L. Allen, T. Fox, R. Abt, K. Zering, R. Campbell, and L. Fetterman. 2005. Turning waste into profits: Exploring the forest alternative. In G. B. Havenstein (ed. ), The Development of Alternative Technologies for the Processing and Use of Animal Waste (pp. 148-157). Proceedings of the 2005 Animal Waste Management Symposium, October 6–8, 2005, Research Triangle Park, NC. Raleigh: NC State University, College of Agriculture and Life Sciences. ISBN 0-9669770-3-3. Environmental Impact (RC&D) Inc. 2003. Longleaf Pine Ecosystem/Animal Waste Management Research, Demonstration, and Education Project, Phase II — Final Report June 1998 through December 2002. Aberdeen, NC: Environmental Impact Inc.
Fox, T. R., H. L. Allen, T. J. Albaugh, R. Rubilar, and C.A. Carlson. 2007. Tree nutrition and forest fertilization of pine plantations in the southern United States. South. J. Appl. For. 31(1):5–11. Furiness, C. S., and E. B. Cowling. 2005. Turning waste into profits: Exploring the forest alternative. Virtual farm tours. In G. B. Havenstein (ed. ), Alternative Technologies for Processing and Use of Animal Waste. 2005 Animal Waste Management Symposium, October 6–8, 2005, Research Triangle Park, NC. Raleigh: NC State University, College of Agriculture and Life Sciences. ISBN 0-9669770-3-3.